You’ll learn to cut and etch copper – using either rubber stamps or drawing your own design to be etched. 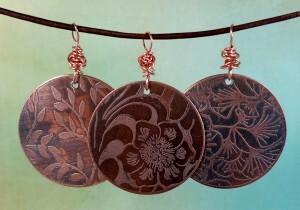 Then learn to patina and polish the etched copper, and voila…an original piece of wearable art! $20 class fee and $25 supply fee to instructor. All supplies included. Our new favorite thing!! We absolutely love these leather bracelets, and with all the different components, the possibilities are endless… just ask the Funky Gals who can’t stop making them! 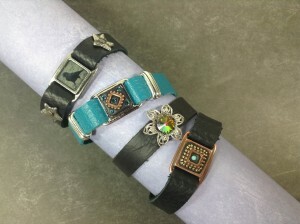 Join us as we share our enthusiasm and tips and tricks for riveting leather bracelets. My friend Amber bought stamped metal tags embossed with her sons’ names and dangles with crystals in birthstone colors from ‘dog tag’ chain in sterling silver. I fell in love with it and invested in the letter sets to make my own! 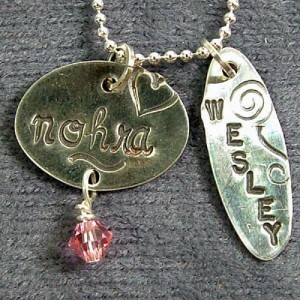 In this class you’ll make your own tags with kids names or words of inspiration using your choice of 4 styles of lettering pounded into sterling tags. They make modern keepsakes for your friends and family! You are going to love learning how to make these awesome bangles and hoops with the fun & creative guidance of our own Funky Joann! Using 16g steel wire, a.k.a. 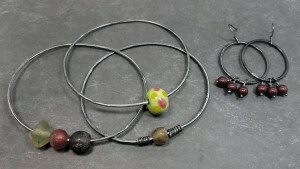 rebar or iron, you will learn to solder a bangle bracelet with a beautiful bead and make smaller hoops for earrings. We will finish the piece and seal it. Tips and techniques for working with this inexpensive material and translating the technique to copper or silver will be shared. Please bring a bead of your choice with a hole large enough to accommodate 16g wire. If time permits, additional pieces may be soldered. Instructor will supply the wire, solder, flux, torch, fire block and solder tool.